Also known as the Hana Lava Tube, these subterranean caverns were created when lava once cooled on the surface here but continued to flow underneath the ground above. Now there are hundreds of unique rock formations throughout the half mile long cavern system, including stalagmites and stalactites. 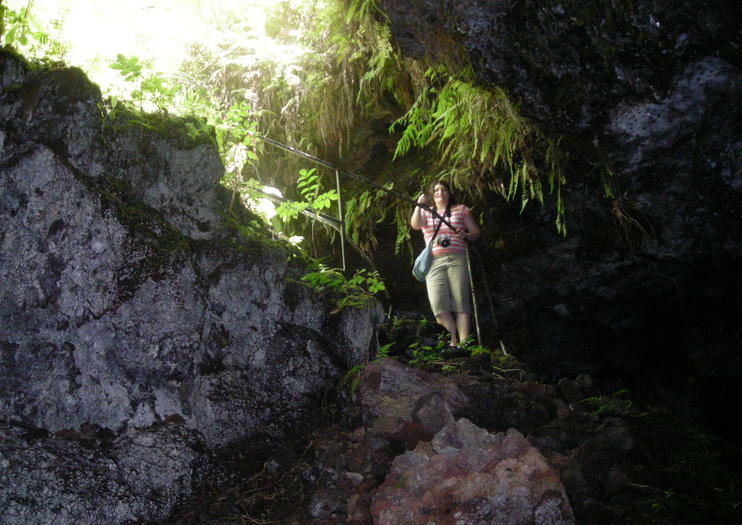 The Kaeleku Caverns are the largest accessible lava tubes on Maui. It is estimated that the caves were formed nearly 30,000 years ago, and legend would tell us they are the work of Pele, the Hawaiian goddess of fire. Water drips from the ceilings of the caves, but bats and insects are noticeably absent from the environment. Much of the caverns look as though they’ve been coated in chocolate. It’s an underground landscape that feels almost otherworldly, waiting to be explored. Above ground, there is a unique red Ti botanical garden maze that is also easy to get lost in. The Kaeleku Caverns are located near mile marker 31 on the Road to Hana (Hana Highway). To reach the visitor’s center, turn left on Ulaino Road from the highway and drive about a half mile. The caves are open Monday to Saturday from 10:30am to 4pm, and admission costs $12. Handrails are present along the walking path, and flashlights or headlamps are both recommended and provided with entry. Bring a jacket, as temperatures inside the caverns can be quite cool. Make the trip along the famous Road to Hana in style during this 10-hour sightseeing day trip by luxurious limo-van, including a stop to explore Ka’eleku Cavern. Enjoy unparalleled views of the Pacific coast and the beautiful rainforests as you drive this incredible road. Then check out the unique subterranean interior of Ka’eleku Cavern and its ancient lava formations. Stop for an upscale lunch before reaching Hana to experience its beautiful tropical nursery garden and waterfall pools, cooling off with an invigorating dip. Your trip includes a light breakfast, snacks, round-trip hotel transport and a guide.